Published April 17, 2015 in category: Uncategorized. Libraries, living rooms, kitchens, and even bedrooms can all benefit from having extra storage, but finding that space isn’t always easy. Vertical space is under-used in most homes, which is creating a trend among designers to come up with better solutions for that space and ways to access it. Keeping a step stool around might seem like it works out alright, but there’s always a better way to get to those higher, hard-to-reach places in and around the home. Library ladders offer a convenient option for accessing the storage space that is hiding in the home’s highest places. As long as there is adequate support on the wall where you’ll be installing the ladder, a custom track can be put into place to slide the ladder along the entire wall, allowing you to reach all the spaces that you might not have otherwise been able to get to. Of course, you should make sure that the rolling library ladder fits into your design in the first. There’s nothing worse than creating a design that doesn’t have room for your featured item, after all. 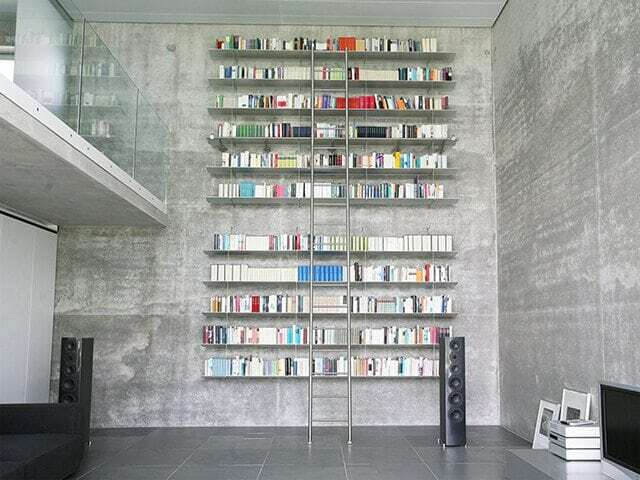 Library ladders look great in the home, as well as in the business world. A lot of restaurants and bars are adding these ladders, as well as wine and cigar clubs that are looking for an elegant way to make a statement. Not only do these ladders look great, but the rolling library ladder also provides an effective solution for accessing high storage in any residential or commercial setting. There are a lot of different ways that ladders can fit into a design, but they should be a feature or a focal point and not just an afterthought. You should plan the room’s design around the concept of including a library ladder so that when you get to that point, it fits well. Also, there are some logistical elements to consider in choosing the right library ladder. For example, if you need a ladder that goes around the room, you’ll have to make sure that you have room to install the newer style of track that is curved to guide around corners. You should also consider the height of the ladder that you need and the finish that you desire. Most modern ladders are made of stainless steel but the rolling library ladder is also available in other materials, or with customized features and accents. Check the floor to ensure that it is level and check the clearance of the track for the ladder to make sure that library ladders are installed properly in any room. Loft Ladders : These ladders have extended side rails that are designed to accommodate access to a loft or a higher level of the home or business. Bent Ladders : These ladders are designed with a bend about halfway up, which is great for installing a ladder around countertops or radiator covers. All you need is the height of the obstruction and a custom ladder can be built for your design. Straight Ladders : These are the most common, simple designs of library ladders available. The ladders go straight up and down, and are perfect to go against a wall, cabinets, or shelves. These are what people consider “standard” library ladders. There’s a lot to love about incorporating library ladders into a new design. If you plan carefully and know your options, you’ll have no trouble adding a unique accent feature that will set off any design and show off your style.